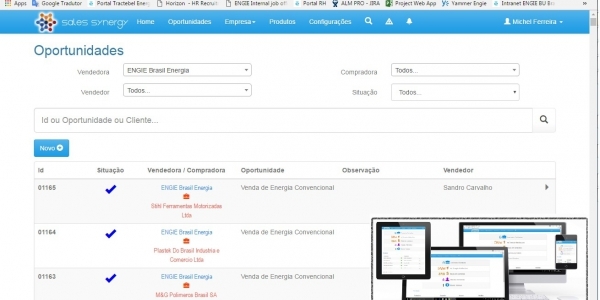 Web App to support the development of commercial synergy among BU Brazil companies, fostering the exchange of information, business opportunities and customer databases among the sales teams in Brazil. We develop a centralized Information System (SalesSynergy) that can import all comercial information from each Operational Company in Brazil and with this information, the user can analyze what was sold/negociated and verify if there is opportunity to offer other products or services to the same client during a negotiation. The indication that a customer has an interest in other products or services can be done by the seller directly in the application.